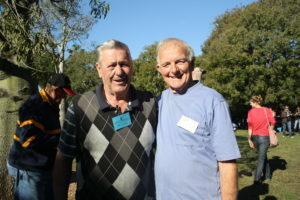 Bill Underwood and Alan Ross met as bubs and are still best friends today with other sixty years of antics they have quite a few yarns to share! Bill and Alan Brisbane July 2012. Chatting to these two is like hanging out with naughty kids at school, there is a lot of nudging and carry on! Alan takes the lead and starts talking about how he is a relative of the earliest pioneers of Frankston. “My family came here in 1875 my Grandfather had one of the first factories in Frankston, and it was the Aerated Waters up on Hastings Road and to get the soft drinks he manufactured, it was taken from a spring which was up near Heatherhill Road and piped down,” he says. Alan grins and says as kids they used to work together at the Peninsula Country Golf Club. “I started over there caddying at the age of six and I used to caddy for ladies who would carry light bags,” he says. Alan says there were many politicians, movie stars and beauty queens that used to stay at different times at the Peninsula Country Golf Club. “Being a caddy you learnt a lot of respect, you learnt to address them as sir, excuse me and yes thank you. You learnt all that because if you didn’t you would not get a job,” he says.